This research is concerned with an engagement scenario involving two interceptors and a single, evasively maneuvering target. The interceptors use data sharing and a staggered launch strategy to reduce the team’s overall miss distance. A differential game-based guidance law (DGL1) is employed, that is based on a perfect information assumption. A previous, recently published research , has shown that by using information sharing and a properly tuned staggered launch strategy, the team’s overall performance can be made to significantly surpass the performance of two non-information sharing interceptors, in the presence of noisy measurements. The goal of the present research is twofold. The first objective is to explore the possibility of employing an asymmetric information sharing structure, consisting of sharing the information acquired by the leading interceptor with the follower, but not the other way around (in the previous work  the information structure was symmetric). This asymmetric mode permits cutting the required communication bandwidth by half. The second objective is to investigate a modification of the differential game-based guidance law, that is based on exploiting its non-uniqueness in the singular region, so as to enhance the performance of both interceptors. 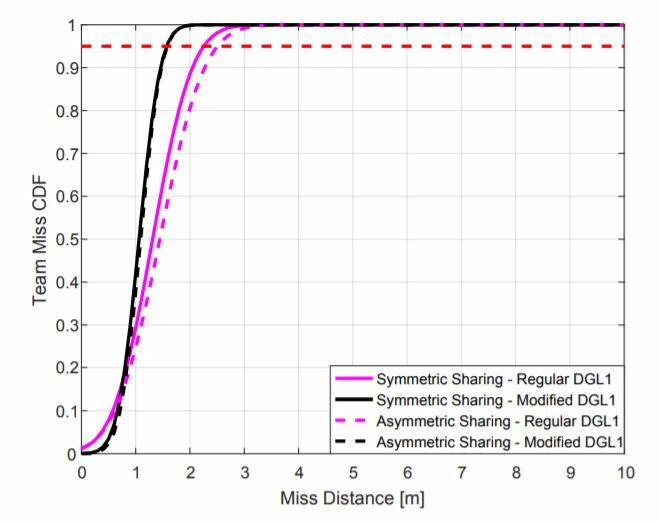 Figure 1, generated via a 1000-run Monte Carlo simulation study, shows the cumulative distribution function of the overall miss distance achieved by a team of two interceptors, in symmetric and asymmetric information sharing modes, when using the regular and modified DGL1 guidance laws. As is evident from the figure, and as could be expected, switching from symmetric to asymmetric information sharing modes, while using the regular DGL1 law, results in some noticeable (albeit not dramatic) performance degradation. Using the modified guidance law results in a much more robust performance, rendering the performance loss, incurred by the asymmetric information sharing mode of operation, negligible.